Civilisation V has been lacking in ex-communist bloc autocracies. Till now. Canny modder Snakeeater337 has brought the state of Arstotzka into Sid Meier’s world of cultural development and a nuclear weapon-toting Gandhi. His mod adds a a new map, units, buildings, and racial traits. Snakeeater337 has provided Arstotzka with border guards – troops that cost no maintenance and receive a 50% combat bonus if they’re fighting within friendly territory. Along with the guard is a border checkpoint. That reduces the rate that spies can steal from you by a third. The checkpoint also has three slots for immigration inspectors. These familiar chappies will earn you three extra gold a turn. The traits for Arstotzka say something of the harsh times the nation has fallen on. For every five citizens there is -1 food and for every city there is -1 happiness. Truly a grey place. However, the workers of Arstotzka are numerous and diligent. For every five citizens you receive a +1 production bonus and you get an extra worker for each city. 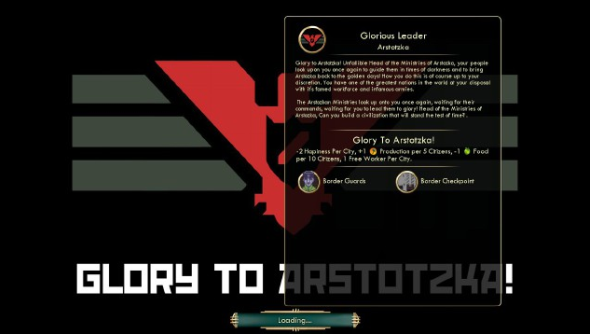 If you have Civilisation V and a copy of the Brave New World expansion then you can add Arstotzka by installing it through the Steam Workshop.